Who Moved My Borscht? : Wash...Dry...Exfoliate! The days of the large capacity washing machine and dryer are yet a distant memory. And the stacking washer/dyer? Nyet. But we are now proud users of the ever popular European “combo” model. 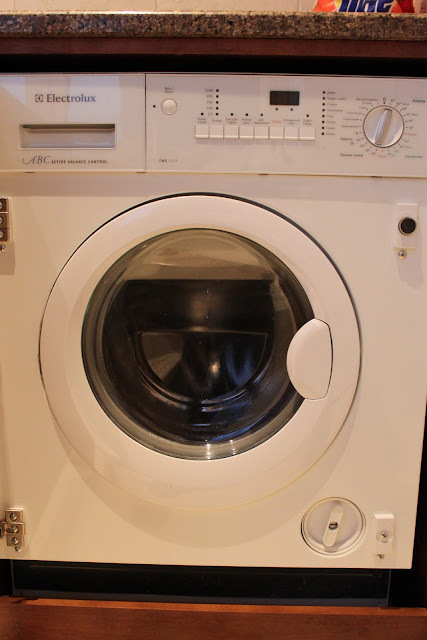 Our machine has two starring roles...washer by day...dryer by night. The same machine does both functions...in theory. Here's the little gem...in Russian, of course. It actually does a fairly good job in the washing department. It hasn’t turned any of our “whites” completely gray although it’s capacity amounts to a pair of boxers, a pair of socks and maaaybe a t-shirt. Any more than that - an error message pops up and I start taking items out. And so clothes washing is in process pretty much 24/7. When the wash cycle is done, turn the knob to the dry cycle....and...well, you have what might be described as more of a “dehumidifying” process. No hot air - just tumbling which often causes the clothes to become more damp than when you started. The drying rack has become king in our household. We can get one single sheet to dry if we put that puppy through the “dehumidifier” about 5 times. Yahtzee! Does this whisper silky softness? How about Brillo Pad along with sand blasting exfoliation and complete skin removal?? Ah, but our skin is so dry, the wire brush-like action actually does us some good! Yo Annsky! Enjoying your posts. From their Doctor Zhivago feel to the dumpster fire that is daily housekeeping duties, you've never made square-peg-meets-round-hole experiences more fun to read. BTW, AI starts tonight! Here we go! That should work fantastic to remove callouses on your feet. It may be ineffective at washing or drying, but Ann, it says "Electrolux" on the front, so you know it's expensive. I actually remember the first washing machine my parents had in Gastonia was a combo. Gastonia in the 1950s; Moscow in the 10s. It's obvious.